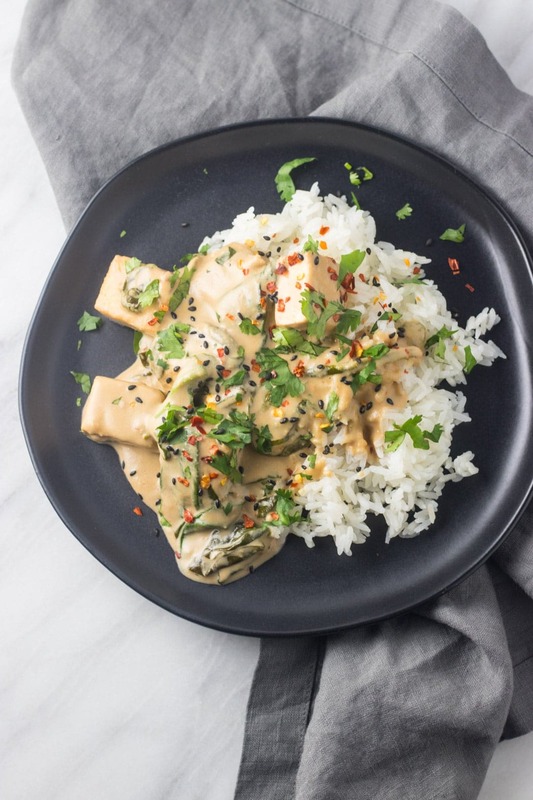 Packed with plant-based protein, this Low FODMAP Thai Pra Ram Tofu is a delicious entree featuring a creamy peanut butter sauce. Serve this savory supper over fluffy rice or cooked rice noodles. 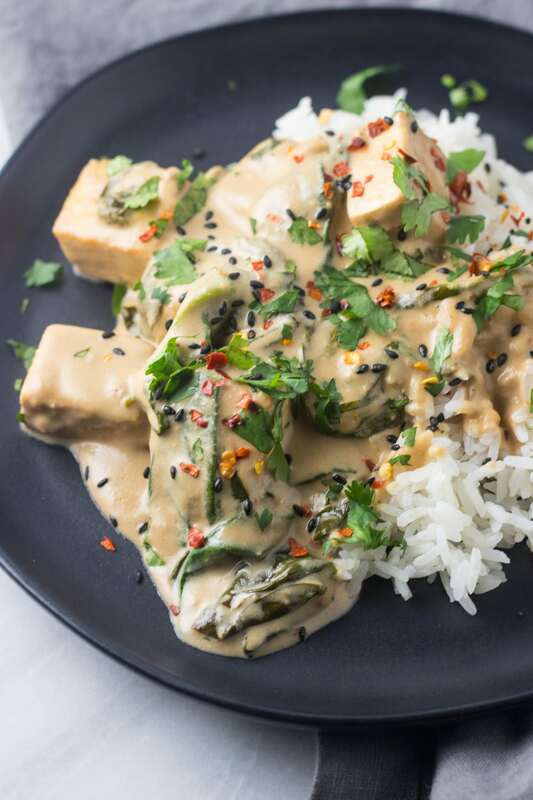 Oh hey there, Low FODMAP Thai Pra Ram Tofu. You may know that I am kind of obsessed with all things Thai food-related. I love curries, Tom Yum Soup, and Thai Citrus Salad. But today’s dish … well it’s a new favorite! This dish is everything Thai food should be – sweet, salty, spicy and sour. And, it has an added nutty creaminess from the peanut butter and coconut milk sauce (aka Pra Ram). Yum! Recently I’ve had some requests for more plant-based recipes. So although I’m by no means an expert in tofu cooking (It’s a relatively new ingredient to me), I decided to make this dish with tofu being the main star. This recipe calls for extra firm tofu which is considered low FODMAP in ⅔ cup servings and provides a more meat-like texture. In case you’re curious, silken tofu is not low FODMAP. If you haven’t worked with tofu before, you’ll want to drain it and then try to squeeze as much of the excess liquid out as possible. I have found it easiest to wrap the tofu block in paper towels, place it on a plate and top it with a cast-iron pan for added pressure. P.S. If you’re not a tofu fan (it’s kind of an acquired texture if you’re not used to it 🙂 ), feel free to make this same dish with chicken, ground pork or shrimp. 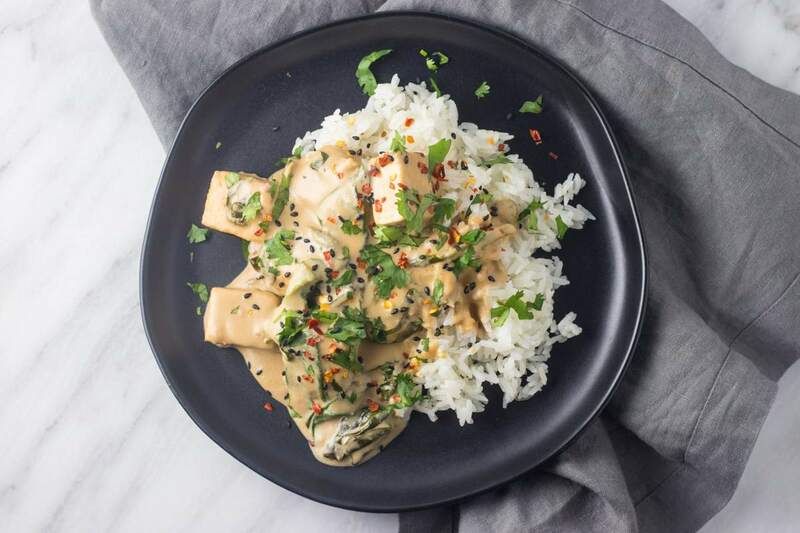 I would recommend serving Low FODMAP Thai Pra Ram Tofu over plain rice, Cilantro Lime Rice or rice noodles. For a side dish, try 1 cup fresh (or frozen) pineapple chunks, 1 medium star fruit, or 2 small mandarins. Wrap tofu in a clean towel. Place a heavy object (like a cast iron skillet) on top of tofu for 20 minutes to press out extra moisture. Unwrap and cut pressed tofu into ½-inch cubes. Heat 1 Tbsp. olive oil in a large pan over medium-high heat. Add tofu, without crowding, and cook, turning occasionally, until tofu is golden brown. While tofu is cooking, whisk together remaining 1 Tbsp. olive oil, peanut butter, rice vinegar, soy sauce, maple syrup, crushed red pepper flakes, and optional fish sauce. Pour over tofu and stir to mix. Reduce heat to medium-low. Add spinach and coconut milk. Continue to cook until spinach is wilted and everything is hot, about 5 minutes. Garnish with cilantro and serve warm. Firm Tofu: A low FODMAP serving is ⅔ cup or 160 grams. Peanut Butter: A low FODMAP serving is 2 Tbsp. or 32 grams. Canned Coconut Milk: A low FODMAP serving is ⅓ cup or 80 grams. Great question, Paula! You’re correct, coconut milk is considered low FODMAP. However, FODMAPs might not be the only components in foods that could be triggering symptoms. Sometimes, higher fat foods (including coconut products) can cause digestive issues in some people. I am not a doctor, so I can’t diagnose :), but in my experience, scratchiness of the throat is more commonly associated with allergies or other (non FODMAP-related) intolerances to food. 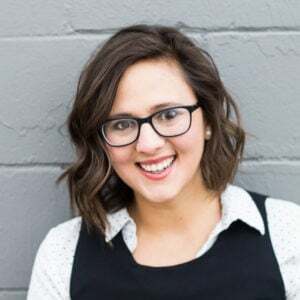 To be on the safe side, I would suggest connecting with your GP for further investigation. Another general recommendation might be trying coconut products in smaller than low FODMAPrecommended amounts, as individual tolerance may vary. Also, coconut milk is only low FODMAP in 1/4 cup servings. So if you’re having more than that at a time, that could be what’s causing the issues. You’re correct DB, serving size does matter. 🙂 According to Monash, a low FODMAP serving size of canned coconut milk is 1/3 cup or 80 grams. A low FODMAP serving of the boxed shelf-stable coconut milk (UHT) is 1/2 cup or 125 mL. 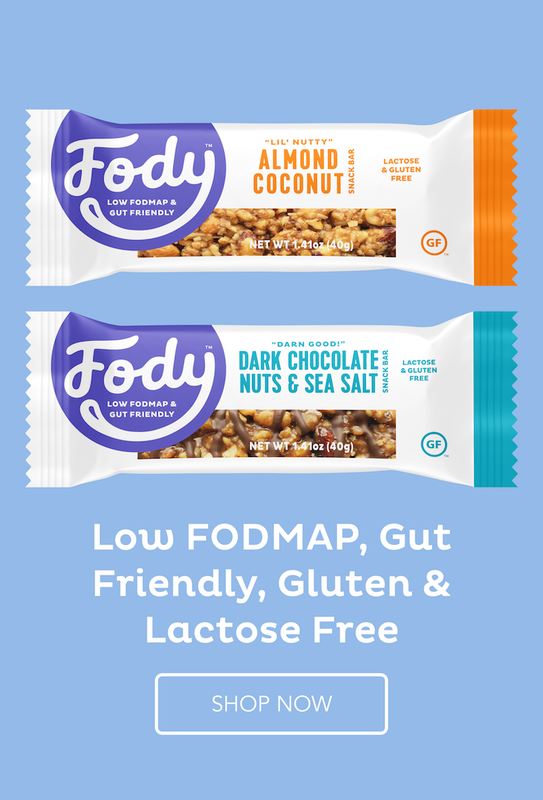 However, actual FODMAP content may vary depending on brands and formulations. Hey Emily! I think you forgot to put the coconut milk in the direction section – nonetheless I added it to the sauce part and it came out just delicious! Thanks for the recipe, and keep those asian/thai flavors coming! That is what I miss eating out the most. Whoops! Thanks for catching that, Kristina! 🙂 I’ll fix that now. Glad you enjoyed it!